Ah, the life of a war criminal in 2011 America. Start wars based on manufactured evidence. Torture people. Then leave office and rake in the money with public appearances in front of idolizing crowds. Plus all those network TV cameos at major sporting events. If you rank high enough in our country’s government, this is what awaits you. President will do. Vice-president. Secretary of Defense. And Secretary of State. 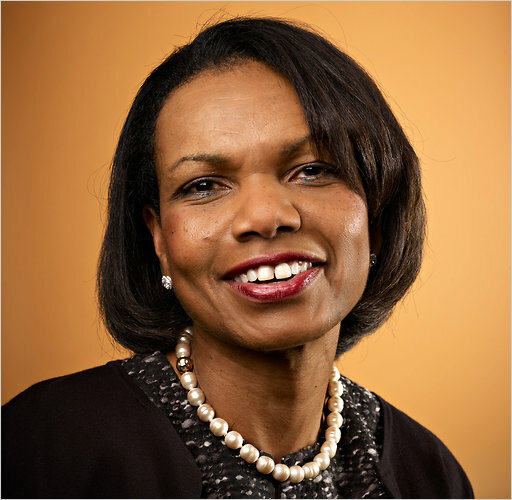 Condoleezza, life is good. And today you get to be the featured interviewee in the NYT Sunday magazine, with Andrew Goldman asking the tough questions. I’ve read that people consider you almost incapable of admitting a mistake. What do you consider to be the biggest of your career? You know, I’ve done pretty well. I don’t spend a lot of time dwelling on the past that way. You can’t think of just one? I’m certain I can find many. It’s just not a very fruitful exercise.